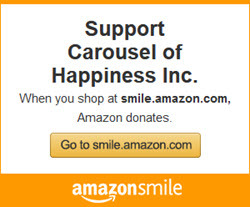 The Carousel of Happiness is a special place. Our goal is to bring a little joy into people’s lives. We are committed to keeping our ride price low, so we rely on many volunteers to help greet visitors and answer questions, sell tickets and ring up gift shop merchandise. If you are interested in becoming a volunteer, please email us at carofhapvolunteer@gmail.com, call our office at (303) 258-3457, or just stop by during business hours. We’re waiting for you! If you would like to volunteer in another area, please let us know and we can talk about other Carousel needs. We value our volunteers’ energy and ideas!